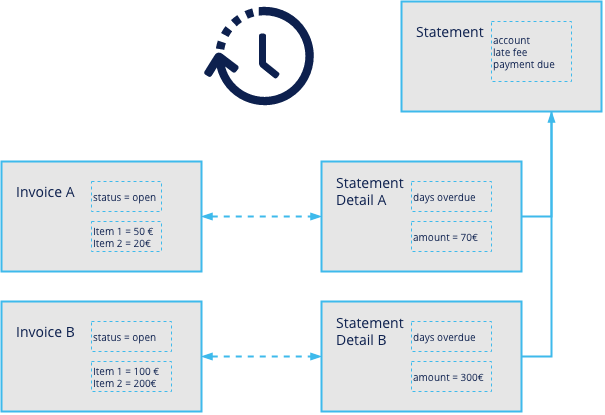 Statements represent the dunning statements that document outstanding payments, based on which you generate dunning reminders to be sent out to the corresponding accounts. The dunning records are associated to the relevant accounts and hold the corresponding data as well as payment information. Statement details represent the individual items to which the dunning refers - the actual invoices and, if set up accordingly, the dunning fees. Dunning details are in a master-detail relationship to a dunning. A dunning run can include multiple invoices per account, producing an individual statement detail for each involved invoice. Consequently, an invoice that is subject to a dunning process relates to the produced statement detail, but not to the statement. For more details, see the Statement and Statement Detail object references. In addition, you can schedule the dunning run job to produce dunning reminders automatically at regular intervals. Dunning reminders are supposed to be finalized using the Finalize functionality. Finalizing dunnings sets them to Closed, generates the PDF dunning reminders to be sent out, and adds the defined dunning fees to the account balance and the open invoice amount. To prevent users from accidentally (or incorrectly) changing the dunning status manually, you set the Status field to Read-Only. Dunning levels control your dunning processes. They determine for which invoices, at what times and, optionally, at what costs you want to notify your customers about outstanding payments. Using multiple dunning levels you can build your individual dunning escalation scenario, which may progress from friendly reminders to firm warning letters. If you apply fix dunning fees, JustOn recommends to include the corresponding information in the dunning detail table of templates for higher dunning levels. Name Text (255) A unique name for the custom setting record. Create Notification Tasks Text (255) If set, creates notification tasks. Specifies the object on which the task should be created. Allowed values include Dunning, Invoice, Account or empty. If empty, no task is created. Dunning Due Number (3,0) The due terms of the dunning in days, defaults to zero if left empty. This value is copied to the field Payment Due of the dunning. Dunning Fee Currency (16,2) A fixed amount that is added to the dunning record as a separate dunning detail. Is always calculated without tax. JustOn recommends to include the fix dunning fee information in the dunning detail table of templates for higher dunning levels. You can define different dunning fees for various currencies. To do so, add the number field ON_DunningFee<CurrencyIsoCode> to the Dunning Levels custom setting, like ON_DunningFeeUSD. Dunning Level Number (18,0) The dunning level determines which invoices are in the scope of this setting (see Condition). Grace Period Number (18,0) The number of days after the invoice payment due. Include Standard Condition Checkbox If checked, the resulting condition is a combination of the default condition and the one defined with the current dunning level. Late Fee Rate Percent (3,3) Defines the monthly interest rate for calculating the late fees for invoices. Falls back to the late fee rate defined the Global Settings if not set. If neither is set, no late fee occurs. Both the dunning fee (fix amount per dunning level) and the late fee (calculated for the overdue invoice using the late fee rate) show up as balance records on the open invoice. To cover your (possibly complex) dunning process requirements, you may have to create different dunning level configurations. Click Manage in the row of Dunning Levels. The mandatory information include Name and Dunning Level. For more details, see Dunning Levels Information. This creates the dunning level configuration, making it immediately available for dunning runs or individual dunning reminders. How to exclude accounts or invoices from the dunning run? (1) Create a custom checkbox, like, for example, ON_PreventDunning, on the Account or Invoice object that defines whether to exclude (if true) a given record from the dunning run. Depending on your requirements, you can have this checkbox selected manually by a user, or automatically via a formula, for example, that can check a record for certain criteria and consequently select (or not select) this checkbox. Following the example, JustOn excludes an invoice from the dunning run if the checkbox is selected (true) and the condition therefore yields false. JustOn ships a default template detail Reminder, intended to overwrite certain template fields when generating dunning reminders and when printing them to PDF files. You need a separate dunning template detail for each dunning level configuration you set up. The name of a template detail must match the name of the corresponding dunning level setting. Use the Reminder template detail as a model when creating your custom template details. Dunning reminders must have unique numbers to comply with legal regulations. When setting them to Closed, JustOn creates the unique and unalterable numbers for dunnings based on defined counters. Your business may require an individual number pattern for dunning reminders, or even multiple ones for different dunning levels. In this case, you must configure the dunning counters and assign them to the corresponding template details. Create dunning counters as necessary. For details, see Creating New Counter. Open the template detail to be edited. In the Information section, double-click the Counter field and specify the counter to be used. If there are no specific dunning counters configured and assigned to the corresponding dunning template details, JustOn uses the configured invoice counter for dunning reminders. The Table Columns field determines the contents of the dunning detail table on the printed dunning reminder. This field contains a list of dunning detail fields, separated by semicolon, which determines the visible table columns and their sequence. You can use any dunning detail field. Remember that the specified order defines the column sequence. Depending on your organization's requirements, you must modify the text building blocks for the dunning reminders. Repeat this step for each dunning level-specific template detail. Feel free to adjust the texts to the intended dunning escalation scenario (see Configuring Dunning Levels). Certain uses cases require to distribute invoices to separate dunning reminders. To this end, add the custom formula field ON_DunningCriterion to the Invoice object, and use it to specify your separation criterion. The following table lists example uses cases for the invoice separation and the corresponding configurations for the ON_DunningCriterion field. Create the new field as required. For example configurations, see the table above. Usually, JustOn creates dunning reminders for each invoice template that an account uses. Thus, if a company (an account) uses different templates, they get as many dunning reminders as they use invoice templates. An account may, however, require to get a combined dunning reminder that includes all open invoices, irrespective of the template used. To support this scenario, you add the custom field ON_DunningTemplate to the Account object. This field must specify the template to be used for dunning reminders - either by its name or its ID. Navigate to the fields list of the Account object. Formula (Text) Specifies the template by name or ID. Once set, this produces one dunning reminder for the account, even if the invoices are based on several templates. Depending on your business requirements, you may need additional information on your dunning reminders. Using the ON field mechanism, you can copy any custom invoice fields to these targets. Remember that the names of the ON fields must match the names of the dunning fields. If your business produces large numbers of invoices, you may require to start the dunning run automatically on a regular basis. To this end, you set up a corresponding job to produce dunning reminders at regular intervals. JustOn recommends to have the dunning run job executed after the payment entry import to avoid inapplicable dunning reminders. Once the dunning run job is scheduled, it executes at the specified time, creating a new dunning run and new dunning reminders for all configured dunning levels. Make sure to check the produced dunning reminders on a regular base, too. JustOn recommends to finish or delete new dunning reminders as soon as possible. There should be no draft dunning reminders left at the end of the job's execution interval. The dunning run job does not require additional parameters. That is, you can set up the job directly for the corresponding Apex class ScheduledDunningRun. For details, see Scheduling Concepts. To schedule the dunning run job, you can use either JustOn's Scheduled Jobs page or Salesforce's Schedule Apex functionality. For details, see Scheduling a Job. From the Apex Job drop-down list, select Dunning Run Job. The Job Name field is automatically set to ScheduledDunningRun. This sets up the dunning reminder generation to be executed at the specified time. In certain business use cases, you may need to recreate the PDF file for an already finalized dunning reminder (status Closed). Doing so does not modify any dunning reminder data. To enable the option for individually recreating a PDF file for a finalized dunning reminder, add the Recreate PDF button to the dunning reminder detail view. Drag the Recreate PDF button to the Custom Buttons area in the Statement Detail section.